Roughhousing. Horseplay. Wrastling. Whatever you call it, it’s one of the best things about being a dad. I love chasing my one-year-old son, Gus, around the house or pretending that the living room is a lucha libre ring and wrestling with him. No matter how stressed out I’m feeling, hearing one of his big, belly laughs erupt as I swing him around like a monkey makes all my cares go away. But recent research has shown that roughhousing serves an evolutionary purpose and actually provides a myriad of benefits for our progeny. In their book The Art of Roughhousing, Anthony DeBenedet and Larry Cohen highlight a few of these benefits and the research behind them. Instead of teaching kids to be violent and impulsive, DeBenedet and Cohen boldly claim that roughhousing “makes kids smart, emotionally intelligent, lovable and likable, ethical, physically fit, and joyful.” In short, roughhousing makes your kid awesome. 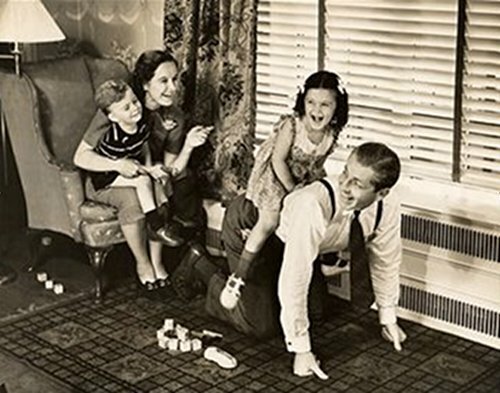 Below, we highlight six benefits of roughhousing with your children. The next time your wife gets on to you for riling up the kids, you can tell her: “I’m helping our children develop into healthy, functioning adults, dear!”…right before performing a baby suplex on your daughter. The problem is that research actually shows the opposite outcome: children who engage in frequent roughhousing are almost always more socially and emotionally adept than kids who don’t. Dr. Stuart Brown, an expert on play (Yeah, you can be an expert on play. Who knew?) says that the “lack of experience with rough-and-tumble play hampers the normal give-and-take necessary for social mastery and has been linked with poor control of violent impulses later in life.” That’s right. 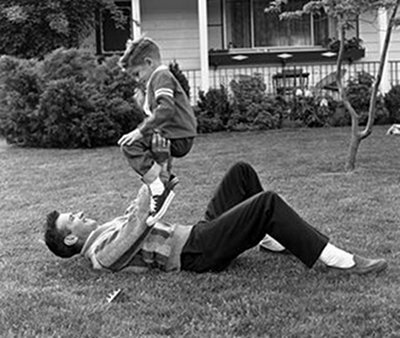 Wrestling your kid around in a play fight ensures that he doesn’t turn into the next Ted Bundy. Keeping him away from the neighborhood cats helps too. What’s interesting is that animals even take part in this back-and-forth role reversal. Adult wolves will expose their bellies and necks to their cubs and let them “win” the play fight. Stronger rats will handicap themselves during bouts of play and let the weaker rat win so play can continue. Marc Bekoff posits that roughhousing may be nature’s way of teaching cooperation to animals, a necessary skill for the survival of a species. 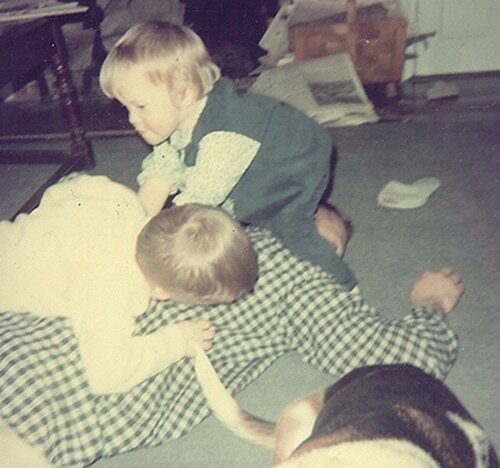 You probably have similar memories of roughhousing with your dad. 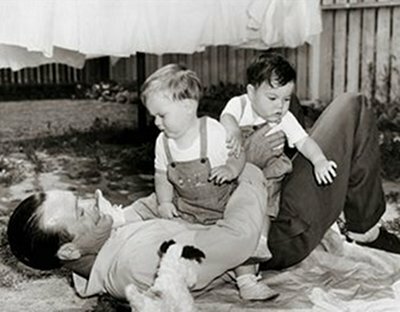 Roughhousing offers dads a chance to physically show their affection to their kids in a fun and playful environment. When Gus and I wrestle, there are lots of hugs and kisses scattered in-between pretend sleeper holds. Don’t roughhouse right before bed. For me, I have a tendency to want to horse around with Gus right before bed. I’m going to miss the little guy while he’s asleep, so I want to get in as much daddy time as I can before he hits the hay. But just like adults, kids need some time right before bed to relax and ramp things down so they can get into sleep mode. Unless you want a little night owl joining you on the couch to watch late-night TV, roughhouse earlier in the day. ~ by Joseph Marana on 02.10.2012.